So whodunnit? 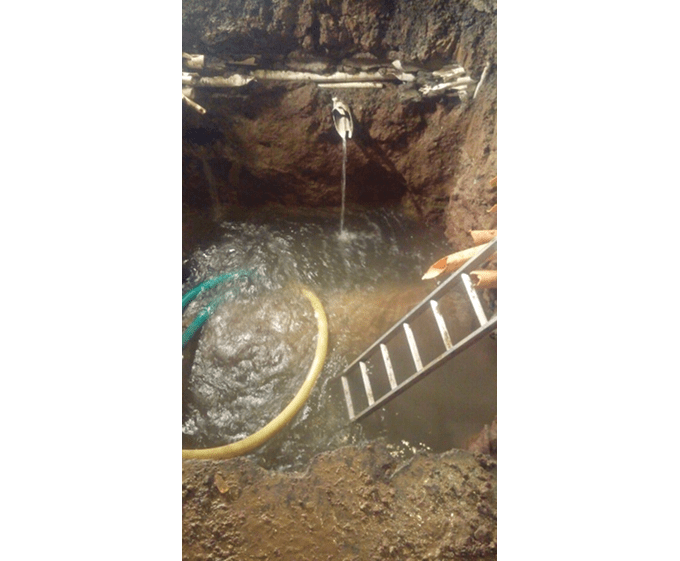 All IDAAN will say is “a private company.” Some of the rabiblanco media say it was “a subcontractor” who was burying utility cables broke the 30-inch water main on Via Brasil. Photo by IDAAN. 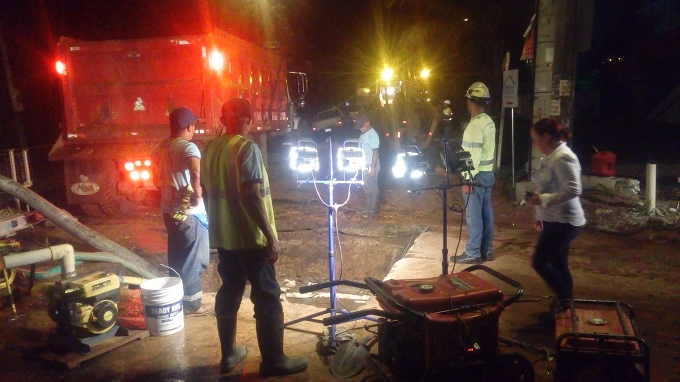 Somebody digging in the right of way along Via Brasil, one of Panama City’s main crosstown traffic arteries, busted a big water main. Immediate damages — the road quickly becomes impassable, causing inconvenience to many and surely some business losses to some whose customers could not come and go by their accustomed routes. Nearly immediate damages — water goes out for about one-third of Panama City, with all of the consequential losses caused by that. It stays out for more than a day and a half. 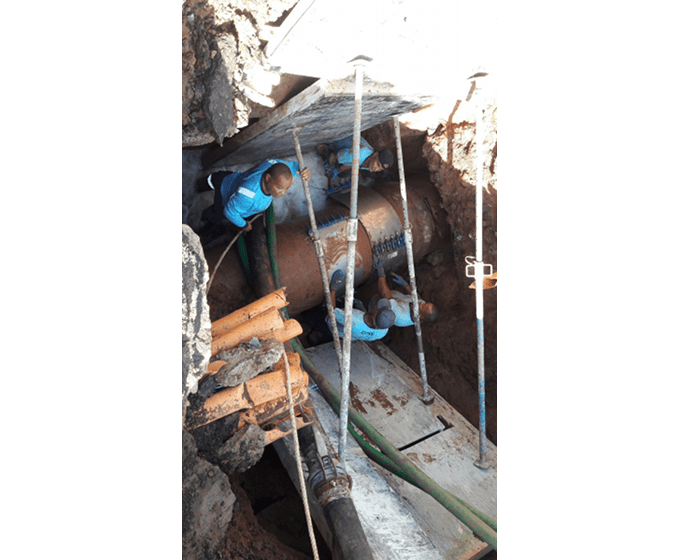 Immediate and continuing damages — all that labor by the IDAAN water and sewer utility, and the problem was fixed with a patch on a water main section that will ultimately need a replacement. Was there insurance? If so, will the insurer pay? Has there been a conversation that began, or will there be one that begins, something like this: ‘You idiots! You dug without properly checking! That’s the last excavation YOU will ever do in this city!’? Or would the conversation be more along the lines of ‘We did everything we were supposed to do, but YOUR map didn’t show that water main where it turned out to be!’? Should we feel blessed, or cursed, that Varela’s nominee who has never litigated a case won’t be on the Supreme Court’s civil bench to hear any appeals? Assignment of liability for what happened may never be addressed. Corporate secrecy and secret bank accounts often make private contractors and especially subcontractors uncollectable and the owners of those companies unidentifiable. The costs and unpredictability of litigation on the Panamanian courts often drive people with valid claims away. Fear of criminal defamation charges, even when there is egregious fault, keeps most media from getting into matters like whose company made everyone go without water, even if they are able to get around the secrecy laws and establish the truth with great certainty. Business news? Out in rural Cocle, two bus rides away from the capital for most of the people in this reporter’s neighborhood, the economic effect could be seen. As in construction workers coming home early, as the worksites on which they had been building were shut down for lack of water starting on a Thursday afternoon, and a few of them returning to the city on the weekend to make up for lost time. Extra bus fares for members of the militant SUNTRACS construction workers’ union? Since when has the chump change of people like THAT ever mattered except when the union forced the issue? And what about IDAAN? Managers of a crumbling system that breaks down a lot, employers of a work force that’s burdened with too many political hirees who don’t know what they are doing nor care to learn, the people at the top who tend to know anything are often replaced en masse with every new administration’s hirings and firings, and even those with civil service protection often flee to any other job they can get just to avoid the overbearing political appointees above them. In this case, the first patch that IDAAN applied did not hold. Was that because they tried to do it without shutting off all of the water pressure first? Reading IDAAN’s updates that appears to be the case. And in the end, the fix was a patch, not a replacement. It has been worse in other administrations. After all, President Varela is an industrial engineer. He’s neither a dictator’s son not a caudillo’s teenage thrill, neither a lawyer nor a financial operator nor a supermarket baron. At least he knows the problem. These sorts of outages take a toll on the Panamanian economy. However, a full accounting is never had. They tried to patch it while THAT was sloshing around? Will the patch be “permanent” if it lasts until the 2019 elections?